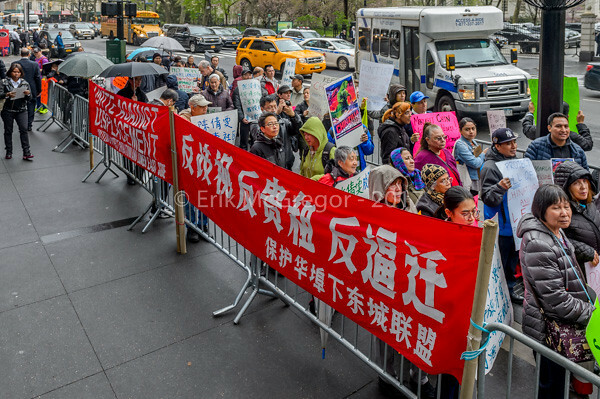 Last week, Lower East Side and Chinatown community members rallied to demand that Council Member Chin be held accountable for her racist policy of displacement and step down now. Council Member Chin has an almost 10 year track record of promoting displacement in Chinatown and the Lower East Side. In 2008, she supported former Mayor Bloomberg’s racist East Village Rezoning in 2008. It led to the protection for a majority white, middle-class neighborhood from the impact of luxury high-rises – rising rents and real estate taxes – and shifted the development pressure to Chinatown and the Lower East Side. It has caused massive displacement in the community. Community members have had enough! We can’t wait until the 2017 elections for City Council. Every day luxury development proceeds in our backyard. We demand that Margaret Chin step down now!